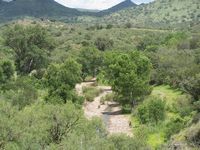 The C6 Ranch lies between Patagonia and Sonoita, Arizona, in Santa Cruz County. 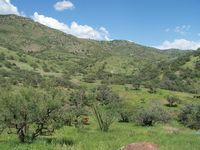 Basically, it is situated south of Sonoita and east of Patagonia at the northwest end of the Canelo Hills. The C6 is comprised of steep hills, ridges, and expansive canyons. 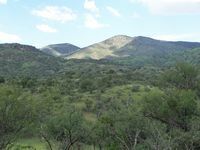 The ridgeline of the Canelo Hills, running from Southeast to Northwest, creates a natural divide through the ranch. Strong grass country, the land contained in the ranch is striking and picturesque in appearance. The carrying capacity is 165 head. The C6 ranch contains approximately 8,700 acres. 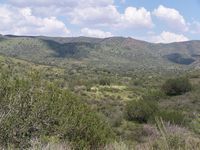 The C6 deeded land consists of 40 acres that adjoins the Coronado National Forest. The Headquarters is situated on this 40 acres and ts improvements include a 1,600 square foot home built in 2005-2006; a barn, and corrals for working livestock. A wide variety of vegetation can be found on the C6. Numerous perennial grasses including blue grama, sideoats grama, hairy grama, sprucetop grama, purple grama, Texas timothy, green sprangletop, cane beardgrass, curly mesquite, plains lovegrass, several different muhlenbergias, and others can be found in abundance on the ranch. Annual grasses are present, but are less abundant than perennials. Browse species include mountain mahogany, cliff rose, ceanothus, and mountain laurel. 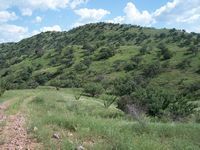 Oak trees, juniper trees, and mesquite trees thrive on the hillsides; ash trees, sycamores and cottonwoods grace the riparian areas in canyon bottoms. The C6 ranges in elevation from 4,200 feet above sea level in Redrock Canyon to 5,953 feet at the junction of the Corral Canyon and Red Bear Pastures on the ridgeline of the Canelo Hills. Annual rainfall averages around fifteen inches. Temperatures are relatively mild, with summer highs occasionally reaching the mid-nineties and winter lows sometimes falling to the twenties. Constructed in 2005-2006, the ranch house is about 1,600 square feet in size. 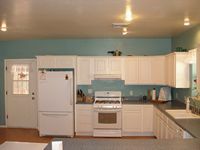 Two Bedrooms, one bathroom, and an open living, dining and kitchen area are spacious and inviting. An extensive outside porch adds to the pleasure of living in this modern ranch house. The house is heated and air-conditioned. The Headquarters Corrals serve as the principal corrals for the ranch. The Headquarters Corrals include a Powder River manual squeeze chute, three pens, a sorting lane and a tub. Interior corrals include the Oak Grove Corrals and the Corral Spring Corrals. The barn/shop is a low-profile structure measuring 40X40 and is supplied with power and water. 17 miles of pipeline, 16 drinkers and 7 water storage facilities. By Sulphur Springs Valley Electric Cooperative. Telephone service is provided by Qwest. Propane is available from several companies that deliver product. By septic tank and leaching field. Grades K through 12 are provided by the public school system in nearby Patagonia. 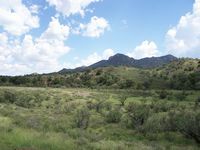 Private land on the C6 Ranch is zoned GR. 2010 property taxes for the C6 Ranch are $984.68. Grazing fees payable to the USFS are $ 1.35/AUM. A wide variety of wildlife occupies the C6 ranch. Locally, the C6 has a reputation for being home to trophy deer. White tail deer, mule deer, javelina, coyotes, bobcats, occasional mountain lions and black bears live together with numerous small game species. Three species of quail occupy the ranch, and many different species of birds can be observed during the course of a year on the C6. The C6 Ranch is for sale for $725,000 cash. The Ranch is shown by appointment only. To arrange a showing contact Tom Hardesty or Sam Hubbell at Headquarters West, Ltd. in Sonoita, Arizona. The C6 has been well-managed, and is in good condition. It is probably the best-watered ranch of its kind Santa Cruz County. Consistently heavy shipping weights on C6 calves reflect the quality of its range and the current management of the C6. Please click here to download (about 500kb) a printable brochure in Adobe Acrobat format. If you get frustrated trying to make this work on your computer, don't hesitate to ask us to mail you a printed and bound brochure instead.